So I'm just saying, keep the one in Stable Repo and withdraw the Test Repo version. Agreed. Sent a msg to pkgrs asking them to pease look at that. I am not sure if that is good. We tout "it just works". This flatpack model reminds me in some ways of Windows in that users go on the net and grab a program from an unknown source. Flatpack seems to mirror that. I maybe missing something. In any case I will cease and desist It is only my opinion and unlikely to change anyone's mind. This flatpack model reminds me in some ways of Windows in that users go on the net and grab a program from an unknown source. Flatpack seems to mirror that. I maybe missing something. In any case I will cease and desist It is only my opinion and unlikely to change anyone's mind. +2. I don't plan to ever use it or Snaps or Appimages. It's pretty rare that a newer version has features that are essential unless one has SNS syndrome. I have looked at a couple and was scared away merely by their size, but I think it's fundamentally bad for Linux to do packaging the Windows way. I'm getting bit tired of Fedora users knocking MX, giving it very low scores because it doesn't do what Fedora does. I don't actually get bothered so much by the negative reviews there. 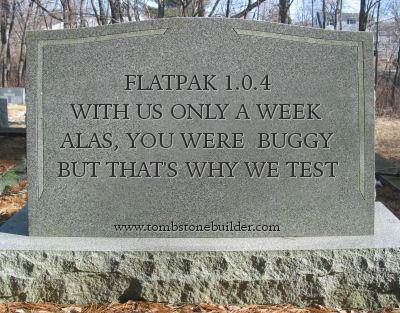 Sometimes they have a point (like the flatpak thing) and sometimes they don't. You can't please everyone all of the time, and most readers of the reviews will assess the comments with some commonsense. Where they have a point, we can act on it. Where they don't, the weight of the evidence of the other more positive reviews will help readers decide. 2. without Korora making the Fedora base easier to use by enabling by default the non-free RPMFusion repos and preinstalling things like non-free codecs, etc, Fedora is not as user-friendly as MX to set up in my opinion. Is it really more intuitive? Hmm. I've never had joy from flatpacks I've tried previously in Mint and now in MX, and the lack of developer control worries me. (I mean the developers of the OS I'm using). It is only my opinion and unlikely to change anyone's mind. I asked Tim to pull 1.0.4 from the TR. Great picture! Will you do my tombstone? That's kind of morbid, but it fits the season. But you can make your own easily at that site.